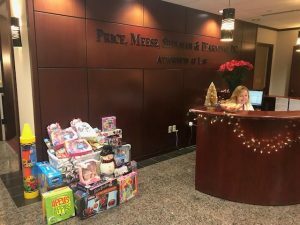 This past December, PMSD kicked off its #25YearsofGiving charitable campaign by organizing a holiday toy drive to benefit the young, courageous patients at Maria Fareri Children’s Hospital at Westchester Medical in Valhalla, New York. In an effort to encourage donations for this amazing cause, we invited our neighbors at 50 Tice Boulevard to join us in celebrating the holiday season at a meet-and-greet event. Food and drink were served as our colleagues and friends contributed generously to our collections. PMSD thanks all those who attended and contributed to this toy drive in order to bring a smile to the children who spent the holiday at the hospital. We look forward to many holiday toy drives to come!